HTC is the company which solved antenna blockage issue by an aluminium body. These problem were in previous iPhone's. nowadays it is funny to see people.. always argument on everything from religion, race, and in the future, i believe there will be war started from smartphone harsh discussion..
Are the execs at HTC really this much shameless?? I mean seriously! Wow, it seems that some brands just cant get any slack on this so called unbiased site. Lets assume that as you say "it still doesn't justify the fact that the One A9 seems to have copied almost every other design aspect from Apple's new iPhones" You agree that their argument regarding the antenna lines is valid. How big of you, where were you when Apple copied them, no subtle jabs then. You call it a iPhone 6 lookalike, oh the irony. It's a lookalike because Apple copied it. Duh. So admittedly it dishes out some of Apples medicine and the world in an uproar. have you even seen the Huawei Mate S? AnonD-331351, 23 Oct 2015obviously htc copied apple design. they now have no excuses left to defend themselves. shame o... moreYou didn't have to attack HTC so hard (even though it's true, to an extent). Oh, and you forgot the bottom of the phone as well, with the speaker, 3.5mm jack and charging port, it's basically the bottom of an iPhone 6 but mirrored. HTC is not my preferred Brand. But this is clear iPod does look like a iP4 and not like A9. And iPad Air also has a different style. Have you ever seen HTC's One design language? Beginning in with HTC One X or S or HTC WP 8X in 2012. They have smiliar Looks like modern HTC Phones. Apple devices looked complete different in this years back. Am I the only one who expected a war here? Ale, 23 Oct 2015Oh please they all 'copy' each other. I do find the following things funny though: 1. be... morein terms of "copy cut", apple hardly copies something from android world. but on the other hand android world is endlessly and enthusiastically copy cutting apple design language and ideas. they are now a half-dead company, so being shameless doesn't matter anything for them now. htc's camera+display is the worst, but their design was quite good. vanishing htc from this competitive mobile world is now just a matter of time. Asus Zenfone is the next Taiwanese sensation for mobile world. I first would like to say that I have the wonderful HTC one M7 love the sense interface. Why does the UK/Europe pay $319 more for less phone, or to put it another way, why are we subsidising USA. Due to my phone being lost I will be buying a new premier smart phone by December, so why should I or anyone else in Europe continuing supporting a company who charge's over $300/ £200 more for less phone. For £399 I could buy a Samsung S 6 (gold) sim free which is a more powerful phone, fact. Now just because 1000's of other companies regardless of what they sell do it, 1000's of wrongs don't make a right. According to what I have read on the Internet on many sites your company is hoping that the HTC one A9 turn's your company fortunes around. As a consumer I can a sure you if you charge over $300/£200 more for less, it won't. obviously htc copied apple design. they now have no excuses left to defend themselves. shame on you htc! you are total cheat!!! your design was much better on the past. copy copy copy... a cheap Taiwanese fake iPhone copy!!! just like another cheap Chinese fake iPhone running Android in a fake iOS UI. HTC has to give up and admit. The One M7 looks very good and premium. Luckily for HTC, Apple used the same metal & strip antenna design and still somehow made it look like crap in comparison with the HTCs. HTC now uses the opportunity to make it's phone look like Apple's and doesn't really worry about turning its phone ugly expecting people to buy it since it looks like the iPhone. Can't blame HTC as it wouldn't be a surprise if enough people actually buy because they can pretend to hold an iPhone. Blame consumer mentality, not only HTC. AnonD-381576, 23 Oct 2015Take the design of HTC Desire 816 (2014) and HTC One M7 (2013) and put it together an we hav... moreLol, funny guy.. Going great lengths to help your beloved company. Guess you haven't seen iPods or iPads design language ? put it together an we have an iPhone 6 or HTC A9. Oh please they all 'copy' each other. 1. before the iPhone 4 ppi wasn't a factor mentioned much (if at all) regarding mobile phone screens, now because Steve Jobs uttered the famous 326 ppi retina limit every oem out there waffles on about the density of their screens. 2. prior to Touch ID pretty much the only major oem to put out a device with a finger print scanner was Motorola with the Atrix, and the rest of the industry could not have cared less. Now after Apple introduce Touch ID every oem is jumping on the biometric band wagon. 3. Gold colour phones, funny how more and more oem's are making gold versions of their phones after...you guessed it the iPhone 5S hit with it's gold colour. 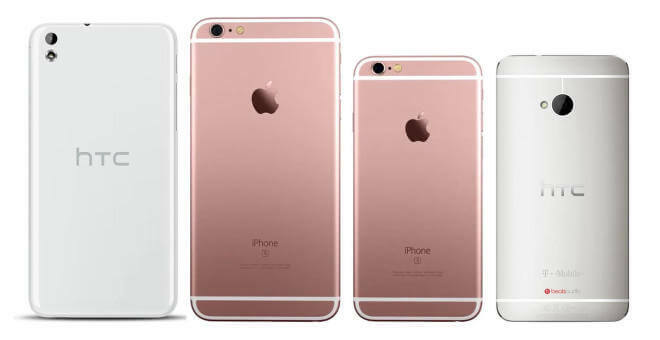 we'll see if the same thing will now happen with this Rose Gold. 4. Personal digital assistants only became a thing after Siri was introduced. THEY ALL COPY EACH OTHER!!!!! Best if you all got used to that and stopped complaining like children over it, as consumers we are the one's who ultimately benefit by this as the designs and features introduced by one manufacturer are 'copied' and improved on by another, who then in turn bring out a feature or design that is itself copied and improved on, and so the wheel turns. Pyro, 23 Oct 2015Both phones copied some elements from each other. So what? Move on HTC and Apple.Dont think its "each other" only HTC copying . Anonymous, 23 Oct 2015I strongly agree that Apple copied HTC design.I always like HTC. HTC M7 copied by many people not only Apple.